Beth received her Bachelor of Science degree in physical therapy from Northeastern University in Boston in 1995. She specializes in treating various types of spinal and pelvic disorders and completed a three-year residency program with the Manual Therapy Institute. Through this training, Beth earned “fellowship” status in the American Academy of Orthopedic Manual Physical Therapists and is practiced in advanced clinical, analytical, and hands-on skills in the treatment of musculoskeletal disorders. 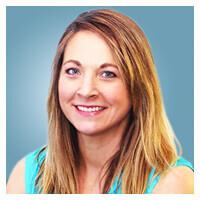 She has been honored with a number of local awards, including New Orleans Magazine’s “Top People to Watch,” and “Best Physical Therapist” from Gambit’s “Best of New Orleans” (Readers’ Poll). Beth currently serves as board president of the South Broad Community Health Center, which plans on opening in 2014. The center will provide high quality healthcare services that are affordable and convenient for nearby residents.